How to change Single Photo View slug? 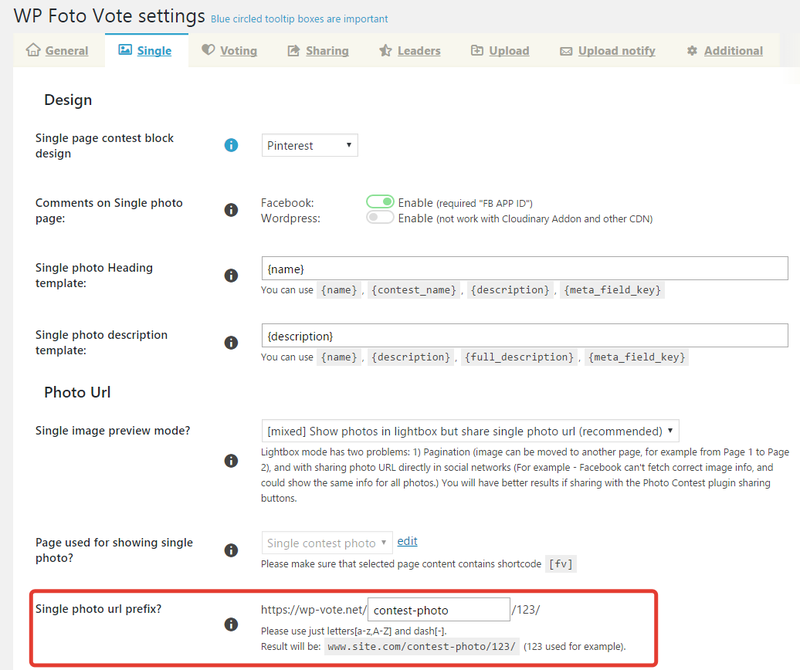 To change it go to WP Foto Vote Settings => Single tab and edit “Single photo url prefix?” from “contest-photo” to for example “competitor“. After go to Settings (wordpress global) => Permalinks and click Save (in order to regenerate the permalinks, else nothing will work). How to create a Single View page? Note: this below actions required just if you deleted Single View page, else all these actions are done automatically by plugin at the installation/update. Create a new page (call it for example “Single Contest Photo”) and paste the shortcode [[fv]] into content. The recommended value for option “Open contest image in a new page?” are “Show photos in lightbox but share single photo URL (recommended)”. Go to Settings => Permalinks and click Save (in order to regenerate the permalinks, else nothing will work). Note: if you change the option “Page used for showing single photo?” you will need to repeat this action.